Whether you're boating for leisure or to make a living, our big-block range delivers the power and performance you demand. Suzuki's DF175 is based on an inline four cylinder DOHC powerhead with a 2,867cm³ (174.9 cu.in.) displacement. While the large displacement contributes greatly to producing exceptional acceleration and torque, it doesn't mean that they are comparatively larger and heavier in size. On the contrary, Suzuki's engineers have targeted this big block motor to be one of the lightest four strokes in the 175 HP class. Suzuki’s talent for delivering high-end power from compact designs is clearly evident in this pair of in-line four-cylinder outboards. Turning the key unleashes big block performance from their 2,867cm3 powerheads but while their large displacement contributes greatly to producing exceptional acceleration, it doesn’t mean that they are comparatively larger and heavier in size. On the contrary, Suzuki’s engineers have designed these big block motors to be compact and lightweight. The DF175 deliver amazing performance but not at the expense of economy. Utilizing a 32-bit onboard computer to optimize electronic fuel injection performance, the DF175 outboard offers superior fuel economy, conform to EURO 1 emission standards, and has received a three-star rating from the California Air Resources Board (CARB). Suzuki outboards are designed with features that make your boating experience that much more pleasurable. The DF175 incorporates a high output alternator to keep an assortment of electronics up and running, water-cooled voltage regulators with isolators that allow use of two batteries, and a conveniently located fuse box. Also featured are tilt limit switch and two engine flush ports. The DF175 is designed to swing a larger diameter prop and feature a more aggressive gear ratio. The combination of larger prop and lower gear ratio delivers superior holeshot, which is especially valued on high-performance boats. The DF175 takes full advantage of Suzuki’s advances in four-stroke engine technology to deliver high-end power and performance. A continuously variable valve timing system like the one found in our flagship DF300 delivers powerful mid-range acceleration. And for top-end performance that has to be experienced to be believed, both outboards utilize multi-stage induction, which provides efficient airflow into the engine at the upper end of the power curve. 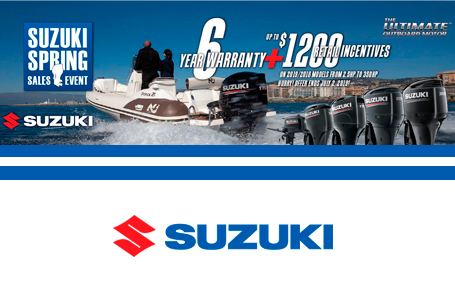 Starting April 2, 2019 and running until July 2, 2019 Suzuki Canada Inc. is offering up to $1,200 in retail incentives on 2019/2018 models AND will continue to offer our industry leading 3+3 Suzuki Protection Plan Warranty on all Suzuki Outboard models from our quiet and efficient DF2.5 all the way up to the fire-breathing flagship DF350. 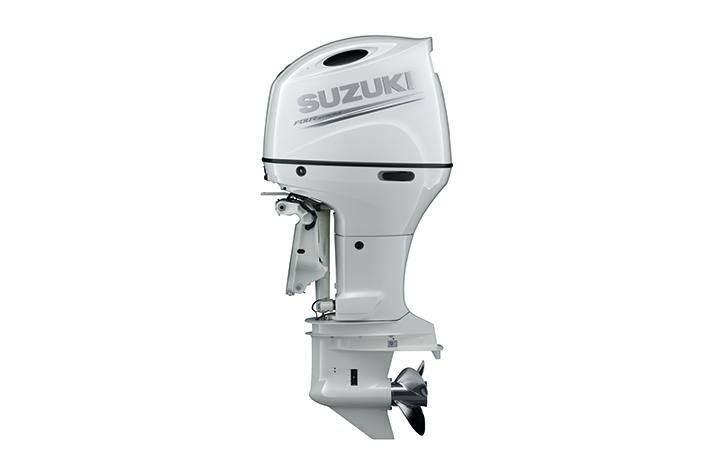 Please refer to the program tables for current offers on your next Suzuki Outboard. 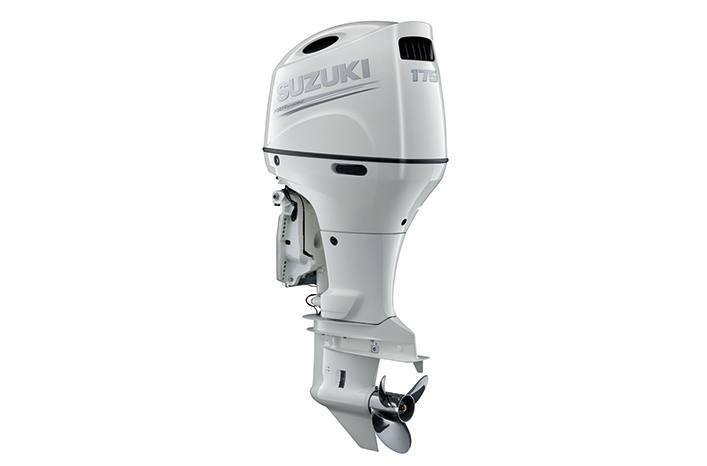 SUZUKI DOLLARS$ available on select new and unregistered Suzuki Outboard Motors purchased at a participating Canadian Dealer between April 2, 2019 to July 2, 2019. Suzuki Dollars$ are direct-to-dealer incentives deducted from the MSRP. Please refer to the Suzuki Dollar$- Outboard Motors Guide below. This promotion is time limited and certain conditions may apply; please see your participating Canadian dealer for complete details. Offer cannot be combined with any other special offers, promotions or financing incentives unless specified. SUZUKI PROTECTION PLAN (SPP) may not be combined with all retail incentives. Suzuki Canada’s 3+3 SPP Warranty applies to new and unregistered Suzuki Outboards and includes our factory 3 year warranty plus an additional 3 years SPP warranty coverage on select 2018 and 2019 outboard models. Additional SPP coverage ontop of the 3 years Factory Warranty is a supplement coverage plan underwritten by Suzuki Canada Inc. that begins immediately after your Suzuki Marine Warranty expires. Please refer to the Suzuki Dollar$- Outboard Motors Guide below. This promotion is time limited and certain conditions may apply; please see your participating Canadian dealer for complete details. Offer cannot be combined with any other special offers, promotions or financing incentives unless specified. Additional freigh, PDI, taxes and other fees are extra upon purchase from your Suzuki dealer. See your authorized Suzuki Marine dealer for full details. Suzuki. Way Of Life.